Debate Teams Succeeds at Tournament Two! 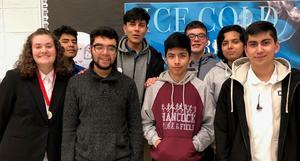 Congrats to our debate team for a hard-fought battle on Saturday, November 17 at Chicago Debates tournament two. Skyler Cepek and Julian Garcia earned individual top-speaker medals and one of the top-team trophies. Ruben Rojas earned the #1 speaker spot in all of his rounds. The debate team meets in 201 Tuesdays and Thursdays from 3:30 p.m. to 4:30 p.m. Students can join any time. The next competition is December 14 and 15 at Bogan.